Situated in the Cove of Zaton, only 400 meters from the beach, Apartments Zaton Bay presents accommodation with a furnished balcony and sea views. Each apartments is equipped with a well-equipped kitchen or a kitchenette with a dining area. Featuring a shower, private restrooms also come with a hairdryer and free toiletries. In the UNESCO-protected historic center a lot of attractive landmarks can be seen, for instance the Old City Walls and Onofrio’s Fountain. 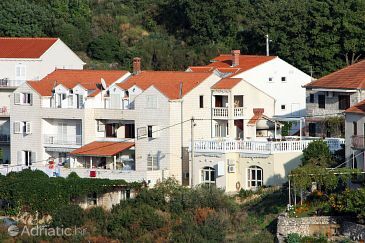 Guest house Katica ~0,2 km, Zaton Dubrovnik price per day from € 84 Bed and breakfast Katica presents a room and a self-catering apartment situated in Zaton, only 4 km from the beach. Free internet access access is available and you can admire the sea views from the shared outdoors terrace. Both the rooms and apartment here will provide you with air conditioning, a refrigerator and a private toilet including free toiletries. They are designed in a modern style and bed linen and towels are supplied. Apartment Anka ~0,2 km, Zaton Dubrovnik Apartment Anka is a self-catering accommodation situated in Zaton. Accommodation will provide you with air conditioning, a balcony and an outdoors terrace. There is a full kitchen with a microwave and a fridge. Featuring a shower, private restrooms also come with a hairdryer and free toiletries. At Apartment Anka you will find a terrace. Dubrovnik Flight terminal is set 24 kilometers away and airport shuttle service is available upon a surcharge. Orasac ( ~ 2.6 km ): 36+ apartments. Kolocep ( ~ 3.6 km ): 17+ accommodation units. Mokosica ( ~ 5 km ): 63+ apartments. Trsteno ( ~ 5.2 km ): 27+ apartments. Lapad ( ~ 5.6 km ): 656+ apartments. Dubrovnik ( ~ 7 km ): 1597+ accommodation units. Beach Kolocep, kolocep ~ 3,7 km from Apartments Zaton Bay Sandy beach: ideal for families, recommended for young people, with restaurant, with caffe bar, equipped with showers. Excellent choice of watersports. Beach Hotel President ~ 4,5 km from Apartments Zaton Bay Concrete beach: ideal for families, recommended for young people, with restaurant, with caffe bar, equipped with showers. Excellent choice of watersports. Beach Copacabana, Dubrovnik ~ 4,6 km from Apartments Zaton Bay Gravel beach: ideal for families, recommended for young people, with restaurant, with caffe bar, equipped with showers. Excellent choice of watersports. Beach Fkk Cava, Dubrovnik ~ 4,7 km from Apartments Zaton Bay Gravel beach: with caffe bar, equipped with showers. Beach Neptun, Dubrovnik ~ 4,8 km from Apartments Zaton Bay Gravel beach: ideal for families, recommended for young people, awarded with blue flag, with restaurant, equipped with showers. Restaurant Arka, Dubrovnik ~ 1,6 km from Apartments Zaton Bay Address: Stikovica 22, Dubrovnik. Cuisine: Croatian cuisine. Restaurant ancora, Dubrovnik Guest reviews: 8,3/10 ~ 1,1 km from Apartments Zaton Bay Address: zaton velicki, Dubrovnik. Cuisine: Croatian cuisine.